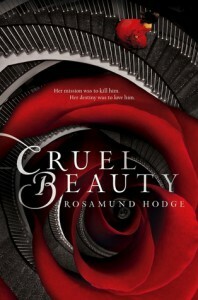 Cruel Beauty by Rosamund Hodge is one of those stories that I wasn’t really sure how I was going to feel about it prior to diving in but I quickly became invested in the story and characters which made it next to impossible for me to put this down. This story is a beauty and the beast retelling but different than what you might expect in that it mixes in demons and greek mythology. Nyx and Astraia are twins and were raised with the intent that one of them would fulfill a promise made by their father. Because of a deal made early in their lives, at the age of 9, Nyx is informed that she has been chosen to save her family and all of Arcadia. To do so, she must marry The Gentle Lord (who just happens to be the prince of demons) and then kill him – something she has been training with her father on since he informed her of her destiny.The first thing that won me over was how much Hodge was able to convey Nyx’s struggle with her destiny. She loves her sister and wants her to be safe but at the same time, she truly resents the fact that she is free to be happy and live her life while Nyx is forced to go off and face this demon who has destroyed her family and will most likely destroy her as well. Before she leaves for the wedding and the Gentle Lord’s castle, she lets her frustrations out on both her father and her sister which leaves her feeling as if she is a horrible person when in fact, she is anything but. On her first night in the house Nyx encounters not only Ignifex, her new husband, but also Shade…his shadow who happens to look very much like her husband…just washed out. Ignifex explains how his 8 other wives died (from what he can recall) and as the Lord of Bargains, he shares the rules of the house. Essentially she isn’t allowed to leave and every night she will have the opportunity to guess Ignifex’s real name. If she guesses correctly, she wins her freedom and if she is wrong, she dies.Ignifex was definitely a mix of impressed and maybe a bit thrown off by Nyx. His comment “Definitely different.” shows that he wasn’t expecting the fight she had. He also doesn’t really have any love for his role as the Gentle Lord. He knows what he represents and it is clear that he feels trapped in his role as well. Despite the fact that he is actually a demon and supposedly evil, I found myself liking Ignifex. He didn’t try to hide who/what he was and I found the first few times he and Nyx were together were great. I loved the dialogue and his overall attitude.“I’m the evil demon lord. 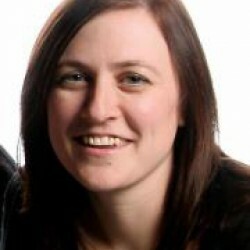 I know it’s not a compliment, but I do like a wife with a little malice in her heart.” He poked my forehead. “If you don’t sit up soon, I’ll use you for a pillow again.”The majority of the story is Nyx trying to solve some of the mystery of who the Gentle Lord is….both with help and without. She is determined to figure out a way to save Arcadia and hopefully herself. Overtime, her relationship with both Ignifex and Shade change and I don’t want to give too much away here but due to the changes in those relationships, she finds herself back in a situation where she needs to decide who is most important to her both inside and outside the castle.I really liked the end of this story and found myself rooting for Nyx to come out on top alongside the people she loves. I thought Hodge did a wonderful job of explaining how things came to be as well as wrapping everything up. I found myself unable to put this book down and if you enjoy fairytale retellings, I think you will like this one as well. I will definitely be watching for more books by Hodge as she completely won me over with this story.Thank you to Edelweiss and Balzer + Bray for the ARC.